Anybody get a huge Wicker Man vibe from this? The animal masks, the old Irish island, the mysterious village and school teacher, and of course all those effigies. If this chapter was inspired by the Wicker Man then I'm psyched, it's a great classic movie (the original, that is)! Yes! 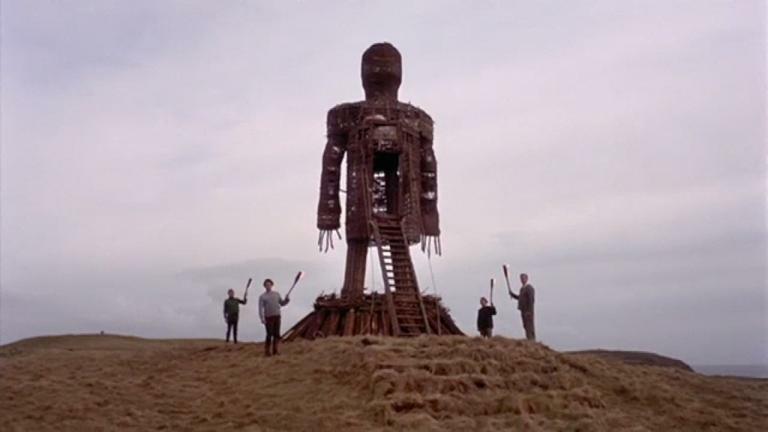 I definitely also caught many nods to The Wicker Man, which I was very thrilled to see! It's one of my favourite films. Apart from all the stuff you've already mentioned, the scene in which you chase the man in the dragon mask is extremely reminiscent of the scene in The Wicker Man in which Seargeant Howie is chasing Oak, the burly villager wearing a horse costume for the May Day parade. The island in TLD is also presided over by a charismatic Lord who is very knowledgeable about the Pagan beliefs prevalent among the villagers. Not to mention the missing child. I am watching it right now and I love the similarities and nods to the movie in the game. I love how the atmosphere/PoV is similar as well, even though the mood is a bit lighter in the movie. The policeman in The Wicker Man is kind of how I imagine Wakefield running around all flustered, trying to solve the mystery. It also got me wondering, are any of the other episodes inspired by other works? The great thing about the film is that it's only light on the surface. The comedy in it makes you miss how unsettling it really is. Once you've seen the ending, you'll know exactly what I mean. frederik_olsen wrote: The great thing about the film is that it's only light on the surface. The comedy in it makes you miss how unsettling it really is. Once you've seen the ending, you'll know exactly what I mean. I just finished it and I see what you mean. I love how it's unsettling in a kind of cheerful way. Or maybe it's just me not used to the pace and tone of older horror movies. The almost comical surface definitely makes it scarier than if it would've taken itself too seriously. I liked the weird sexual stuff in it as well. And Christopher Lee was brilliant. Any other horror movie recs? The reminescence of Summer Isle in this episode of TLD is something I cheriched deply. I love the movie and the dialogues of Detective and Lord Summerisle, the immersive atmosphere of old celtic beliefs reemerging and flourishng in somewhat savae and yet freeing manner. And on the subject of similar inspirations, I would like to recommend an EP by the band Agalloch, which also was inspired by this unique and captivatin motion pictore.